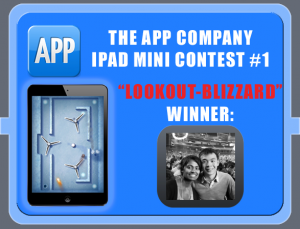 It has been an exciting month for The APP Company as we have just finished hosting the LookOut-Blizzard iPad Mini Contest through our Facebook. What an event it was! With over 3,000 contestants and over 500 additional entry screenshots submitted, we are more than pleased with the amount of contestants whom took part. However, there can only be one winner which is why we want to offer a special congratulations to Kevin from NYC. Way to go! We would like to take this time to announce our second iPad Mini event for our upcoming game Sky Island. We are really excited about this game as it is our first take at a physics puzzler game. To offer a bit of history, Sky Island was originally a game called Tick Flick developed by the Australian Glitch Game Studios. These guys are amazing and the process of remaking their game was a difficult one. We are pleased with the end result and love the world that these guys have created. The iPad Mini contest for Sky Island will be hosted through The APP Company’s Facebook throughout the month of May. We expect a large following and hope to have as many contestants as the first contest. We will post a blog entry as soon as a winner is announced.